The Ewing Gallery of Art and Architecture has a number of exhibitions available for tour to other venues. If you are interested in hosting one of these exhibitions at your gallery, please send an email to ewing@utk.edu for more information. This exhibition includes 72 works of art from the permanent collection of the Ewing Gallery of Art and Architecture. 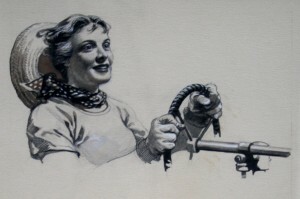 Showcased is Joseph Delaney's mastery of a wide variety of media, ranging from oil paintings, to pen and ink drawings, to charcoal drawings, to pastel portraits and watercolors. The exhibition also explores Joseph's love for the urban environment and his interest in depicting the human figure as participant within the built environment of New York City. From 1951-1960, the artist Salvador Dali worked to complete a suite of watercolors illustrating Dante's Divine Comedy to celebrate the 700th birthday of the Italian poet. Later, master printers would work to generate wood blocks to reproduce and publish Dali's original paintings. This is the complete series of Dali's 100 prints illustrating Dante's Divine Comedy. In 1942, the Army Corps of Engineers relocated James Edward Westcott to Oak Ridge, Tennessee, and assigned him the task of official photographer for the Manhattan Project - a massive wartime effort to produce the first atomic bomb. As secrecy of the project was paramount, the "atomic" city was fenced, and communication with the oustide world was limited. What is more, no cameras were allowed inside its boundaries. 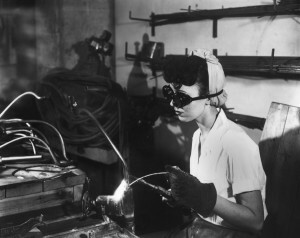 Thus, Westcott became not only the official phtographer for the Manhattan Project, but he also became the sole photographer of the social and recreational events of Oak Ridge. It is only through Westcott's photographs that the visual history of Oak Ridge can be appreciated. Walter Haskell Hinton (1886-1980) was an American Illustrator during the "Golden Age" of illustration from about 1910 through the 1940s. Over the course of his career, Hinton generated ad images for "The Saturday Evening Post," John Deere, Fairmont Railways, Washington National Insurance Company, Austin-Western, and Orange Crush soda. He also created the cover images for many issues of "Outdoor Life," "Sports Afield," and Western pulp magazines. This exhibition focuses on his work-in-progress watercolor illustrations for these popular magazine covers. 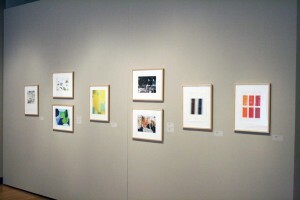 The 75th Anniversary American Abstract Artists Print Portfolio, a exhibition consisting of 48 archival digital prints. AAA published its first portfolio in 1937. It consisted of 30 lithographs and, in lieu of a catalog, accompanied the group's first exhibition, which was held at the Squibb Gallery in New York City. In addition to that first portfolio and this 75th Anniversary portfolio, only two others have been published—one commemorating the organization's 50th anniversary, and one for the 60th. All prints are 9.75" x 12.75"
This small exhibition includes 16 lithographic prints from the permanent collection of the Ewing Gallery. 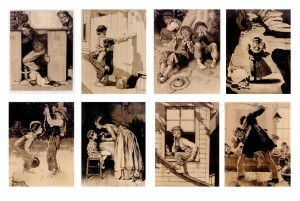 These prints were produced in the 1970s based on original illustrations Norman Rockwell created in 1935 for editions of Tom Sawyer and Huckleberry Finn released by Heritage Press and Limited Editions Club Books. The South African Bill of Rights was born out of a long struggle against racial segregation and human rights violations. Until the first democratic election in 1994, the majority of South Africans had been excluded from participating in the political process. Talks in the early 1990s between political prisoner Nelson Mandela and then South African leader F.W. De Klerk ultimately led to free elections and a new government which aimed to respect the rights of all its citizens. Images of Human Rights features 29 fine art prints, created by artists representing the nine provinces of South Africa and hand printed by master printmaker Jan Jordaan. The print portfolio was conceived of and released in 1996 by the Images of Human Rights Portfolio Committee. This exhibition of 41 black and white photographs is drawn from the collections of the Fondo Documental Afro-Andino and the Universidad Andina Simon Bolivar. The Color of the Diaspora: Afro Ecuadorian Images endeavors to show, in visual form, elements of the lived Diaspora among black peoples in Ecuador and match them with collected oral testimonies. Through the presentation of the black and white photographs taken over a 30-year period in the regions of Esmeraldas and the Chota Valley by two Afro-Ecuadorian photographers -- Juan Garcia and Edizon Leon, both of who are from the communities represented -- the exhibit offers a shift in focus.